We’re counting down to The Wellington Wedding Show! Next weekend we’re exhibiting at The Wellington Wedding Show a great source of inspiration for planning your special day. This year the Show moves to its new home at the TSB Arena (Queen’s Wharf). We’ll be screening films and taking bookings for 2010/11. Keep an eye out for our vibrant blue stand - we’d love to hear about your wedding plans. 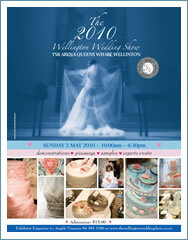 The Wellington Wedding Show, Sun 2 May 2010, 10am-4:30pm, TSB Arena, Queen’s Wharf. Admission $15. Handy tip: Parking at Queen’s Wharf can be a bit pricey - if you get into town early, park on Oriental Parade and enjoy a waterfront walk to the Show instead. The DomPost’s annual wedding supplement Bride Magazine comes out with Monday’s paper (26 Apr). As well as a guide to local wedding products and services, the magazine includes a feature on Alex & Kevin’s wedding which we filmed in Rarotonga at the stunning Te Vakaroa Villas. The wedding was expertly managed by Rarotonga wedding planner Polynesian Moments, the island’s leading wedding and event planning team. We’ll be showcasing films from both Rarotonga and New Zealand at The Wellington Wedding Show. This year we’re filming in Rarotonga June 23-late October 2010. We’ll also be helping out with the family stand at the Punanga Nui weekend markets - if you happen to be in Rarotonga (perhaps for an early honeymoon? ), drop by the markets for a complementary coconut-chocolate-chip cookie. We’ve recently updated our packages for the New Zealand 2010/11 wedding season, along with finishing touches for your film including bride and groom preparation coverage and guest interviews (for those who want to leave personal video messages at your reception). Until the end of May we’re offering a 10% early booking discount on our popular Pearl package - including full ceremony, photoshoot and reception coverage. If you’ve decided to film your big day, we encourage you to get in touch before the wedding show to make sure you don’t miss out on your date. Video still: Poppy & Jamie’s wedding - Wellington harbour as seen from The Boatshed. A wedding video is the best way to capture all the detail of a day to remember. To arrange your free consultation, contact Justine Flanagan, +64 4 3800 800 / justine@tiarefilms.com. Thanks for reading our newsletter. If you have any questions about filming your wedding, or feedback to our work, we'd love to hear from you.